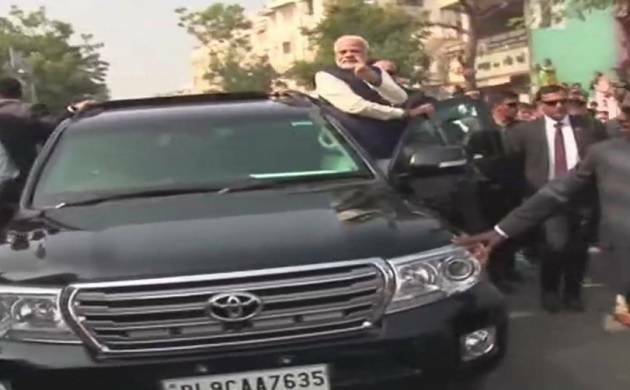 PM Modi, after casting his vote in Ahmedabad's Ranip, had walked a certain distance to greet people standing on both sides of the road outside the polling booth and stood on the foot-board of his car, waiving to the crowd. Congress on Thursday accused Election Commission of behaving like BJP's "puppet" by not acting against Prime Minister Narendra Modi, who, the party alleged, had violated model code of conduct by holding a “roadshow” after casting his vote in Ahmedabad’s Ranip. PM Modi had walked a certain distance to greet people standing on both sides of the road outside the polling booth and stood on the foot-board of his car, waiving to the crowd. Addressing a press conference, Congress party spkesperson Randeep Surjewala accused Election Commission (EC) of being a “puppet” of Prime Minister Modi. “Gujarat elections will not be decided by photo-ops, sea planes and roadshows. It will be decided on progress and issues related to development,” Sujrewala added further. Earlier on Wednesday, the Election Commission had directed the Chief Electoral Officer of Gujarat to initiate necessary action by filing FIR against Rahul Gandhi and asked the leader to reply by 5 pm on 18th December over his interview to TV Channels. ‘Explain why action should not be taken against you for violating provisions of MCC, failing which Commission will decide matter without any further reference to you,’ an Election Commission notice to Rahul Gandhi read. Voting for the second and final phase of assembly elections in Gujarat was held on Thursday in 93 constituencies spread over 14 districts of Central and North Gujarat. The results will be declared on 18 December.